While the National Transportation Safety Board has yet to conduct a full investigation, authorities believe that the geese were sucked into the plane's two jet engines, causing immediate engine failure shortly after takeoff from New York City's La Guardia Airport. The aircraft, an Airbus A320, has engines designed to handle damage from birds weighing up to 4 lb., according to Todd Curtis, founder of AirSafe.com and an aviation-safety expert. Canada geese  the suspected culprits  weigh an average of 10 lb. More than 219 people have been killed worldwide as a result of wildlife collisions since 1988, according to the volunteer organization Bird Strike Committee USA.  Most commercial airlines are now replacing older three- and four-engine planes with more-efficient double-engine aircraft. Because these newer engines are quieter, birds are less likely to detect and avoid them. Worse still, fewer engines mean fewer backups should a plane and a flock of birds cross paths.  While officials use radar and radio collars to track bird populations, habitat destruction and climate change have disrupted migratory patterns. Moreover, the populations of certain species of birds are increasing at rapid rates, thanks to changes in food supply. The Canada-goose population, for example, increased 4-fold from about 1 million birds in 1990 to 3.9 million in 2008, according to Richard Dolbeer, one of the report's co-authors.  Air traffic has increased markedly during that same period, growing from 310 million airline passengers in 1980 to a record 749 million in 2007, meaning the skies are more crowded for both birds and Airbuses.  To further complicate matters, officials must be careful to identify which type of bird is struck in each incident, to help biologists conduct wildlife-management programs without violating laws that protect endangered species. It's not just a civilian concern, either. In 1995, the U.S. military began re-evaluating its Bird Aircraft Strike Hazard (BASH) program after a $270 million U.S. Air Force E-3 Sentry struck a flock of 31 Canada geese during takeoff, causing a fiery crash that killed 24 service members. Solutions to the problem currently in use include habitat modification (planting specific types of grass that are distasteful to birds), aversion tactics (using dispersal teams, a.k.a. "goose guys," to scare them away) and lethal control (killing a specific number to reduce populations). Commercial airports like New York City's J.F.K., meanwhile, have gotten just as creative: hawks and falcons, which fly solo and are therefore less dangerous, are released near runways to scare away flocks of seagulls and geese. Other airports hunt and destroy birds' nests and eggs. "The risk is real," Curtis says. "Birds are a threat every day." 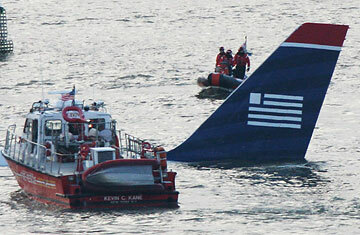 Even so, the fact that birds disabled both engines of US Airways Flight 1549 simultaneously is far from common. "Only on rare occasions do you have them causing a crash [like this]." Read "Q&A: How to Survive a Plane Crash." Read "How to Survive A Disaster."